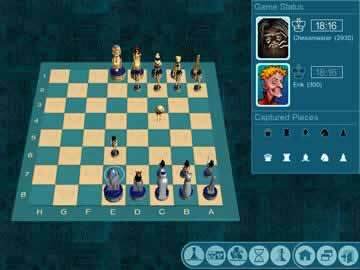 Chessmaster Challenge Game Review - Download and Play Free Version! One of the world's most popular games for centuries, chess is the classic board game of the mind! It can be played anywhere, anytime, and now you too can enjoy all the benefits the great game of chess has to offer. Based on the award-winning Chessmaster series which sold over 5 million copies worldwide, Chessmaster Challenge provides the definitive chess experience for players of all types and skill levels. In Ranked Play, you're pitted against any of 28 computer opponents of varying skills and ratings, so you're sure to find a suitable player to challenge. You can even start off playing Stanley the ape, who holds a rating of 1 and moves almost completely randomly! Move on to better adversaries as your skills increase. Who knows? Maybe someday you'll be able to challenge the world's finest - Josh Waitzkin, Bobby Fischer, even the Chessmaster himself! For beginners, Chessmaster Challenge offers extremely thorough chess lessons from board setup and basic piece functions to complicated moves and advanced game strategy. By the time you finish the tutorials, you'll know the game better than you ever thought possible! Even veteran chess players can find rules they didn't know about or helpful tips that will give them that all-important extra edge on the competition. Ranked Play or Training Mode - Whatever You Want! Once you've learned the fundamentals of chess, you can test your skills by jumping right into a Ranked Play, tournament-style game. Don't feel quite ready for that just yet? 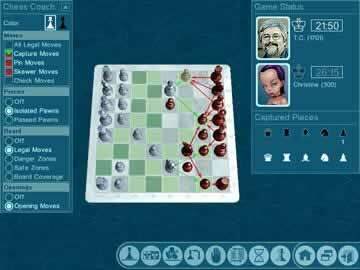 No problem, because Chessmaster Challenge also comes with a Training Mode which helps you along as you play. Ask for a hint, enable blunder alerts, show all possible moves, or take advantage of other helpful aids to make your game the best it can be! For a change of pace from the regular game, take an excursion into the third style of gameplay in Chessmaster Challenge - puzzles! The game includes 8 types of quick and fun chess problems, from Find Check and Mate in Two to Avoid Mate and Move to Safety. In each one, you are tasked with finding the single move that will accomplish the goal. The variety of chess problems means that you can improve every part of your game, and there's a random puzzle generator to ensure that you won't get the same puzzle twice! Easy to Use and Easy to Play for Everyone! Chessmaster Challenge replaces the extra glitz and glamor of some games with substance, letting you get down to what you do best: play chess! The game does include 6 different board and piece styles, like Cartoon 2D, Egypt, Staunton Marble, and Classic Wood. Change between your favorites in the middle of a match without affecting gameplay at all! The interface is sleek and user-friendly, and suitable for aspiring grandmasters of all ages. Beginner, veteran, or expert, there's something for everyone. Tutorials, Training Mode, Ranked Play and chess puzzles all provide a depth of chess experience that is rarely found, so protect your king and go on the attack today and download Chessmaster Challenge! Chessmaster Challenge is a game that will likely have little appeal to those not interested in chess. For fans of chess or players in the mood for some chess action, it's a great choice. There's even a training mode and learn mode to teach you everything you need to know to play chess and win. A few puzzles are included as well to put your skills to the test. Take on any of the 25 AI opponents as you battle for the win and a better ranking. The game plays like any normal game of chess would. You control several different pieces on an 8x8 board, and your goal is to place your opponent in Checkmate. For players with past chess experience it should be familiar and straightforward. For anyone else, there's help provided to explain how to play the game. Chessmaster Challenge includes several different modes of play that let you learn the basics or take on the AI opponents in ranked chess matches. The Learn mode is where you can learn anything and everything you need to know about chess. This mode teaches you the basics (and some more advanced things as well), and then tests you on the topic you just covered. The Training mode lets you take on one of the AI opponents in a game that won't affect your ranking. Training mode lets you undo moves, receive hints, will warn you when you make bad moves, and can show you moves available to you. It's a great way to get your feet wet before putting anything on the line in real chess matches. The Fun mode consists of a few puzzles to solve by moving various chess pieces. The Ranked Play mode is one that lets you take on one of the computer opponents in a match. A victory increases your ranking, while a defeat or stalemate lowers it. There are a few downsides when playing the game. The biggest issue is that there's no option or ability to play against another player. While having different computer opponents is great, there's still no substitute for another person. Additionally, you have to wait a large amount of time for the computer players to make moves, especially for the higher ranked ones. There's no way to speed up their moves or force them to make one quickly. The computers also sometimes make strange or stupid moves that can cost them the game. The presentation in Chessmaster Challenge has some good points, but some issues as well. You can choose from one of six chess sets to play on. Three of these sets are 2D, three are 3D. However, the view on the 3D boards makes it a bit hard to properly see/view the board and can't be changed. The overall graphical quality of the game isn't amazing either, but this is only a chess game. Another issue is that there's no sounds when playing. While some players may enjoy the quiet, waiting for several minutes of complete silence for the computer to move can be annoying. 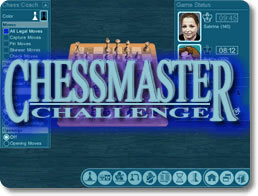 Overall, Chessmaster Challenge is a decent choice for anyone interested in or looking for a chess game to play. There are some issues with the length of time computers take to move and the presentation is a little lacking, but the chess basics and gameplay are all there. There's a large selection of computer opponents to take on or a few puzzles to challenge yourself with. There's plenty of information to get you started in the game and give you some helpful tips.